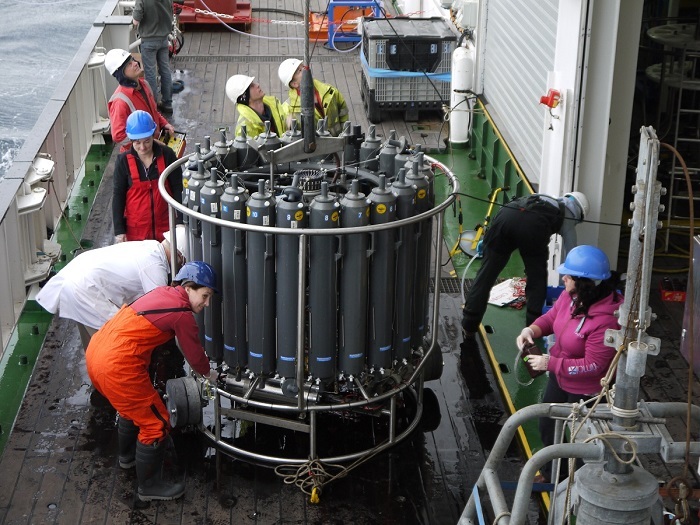 UK Shelf Sea Biogeochemistry Blog: At the shelf edge, and rolling…. November 14th. We are out at the edge of the continental shelf. Work had to stop early this morning as the waves reached 7 – 8 metres, making it too difficult to get our instruments over the side safely. We are now sat here trying to get a weather forecast, so that we can decide whether to stay out here and wait for the waves to settle down, or turn back onto the shelf and work in the shallow water. Yesterday’s work started off very well. We managed to do 5 out of 6 sets of measurements as we headed southwest from the central Celtic Sea. We have collected a great set of information on the distribution of the autumnal nutrients out towards the shelf edge. Unfortunately we couldn’t collect any information on iron in the sea, as the instruments used to do that use a wire that has a lower breaking strain – we are fairly sure it wouldn’t survive the sudden snatches the wire gets when getting gear back onto the ship in these waves. We’re rolling heavily now! The ship has turned direction slightly to try to get a signal to our back-up internet connection – then we can get a weather forecast and start to plan the next few days.